Milton Lim in Theatre Conspiracy's Foreign Radical. Photo by Robert Dewey. Timing really can be everything. 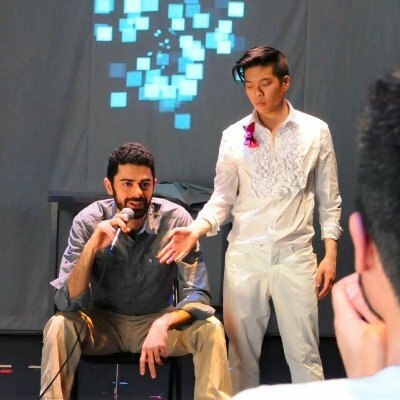 When Theatre Conspiracy first presented Foreign Radical in 2015, Canadians were debating the ominous sounding Bill C-51 (Security of Canada Information Sharing Act and the Secure Air Travel Act). Two years later, this remount plays against a landscape of a Liberal government debating changes to Bill C-51, but in addition, and arguably more importantly, it plays against the backdrop of a paranoid Trump regime. In fact, this new iteration has been revised to include the new Trump world we live. It is a testament to the impact and relevancy of this show, where it can be updated in almost real-time. While this newest version of Foreign Radical has been updated to include references to the new U.S. President, little of its structure has changed. 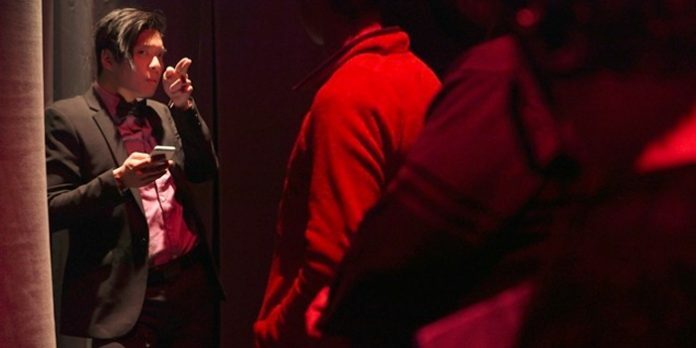 As the host, an animated Milton Lim takes audiences through a series of “games”. During these games, Milton asks a series of questions from the innocuous to the very personal. He once again asks us to “go with our gut”, and depending on our answers, the audience is separated and re-assembled in quadrants in one of four rooms, or into different rooms entirely. Aryo Khakpour and Milton Lim in Foreign Radical. Photo by Robert Dewey. In my second viewing of the show there appears to be a new dynamic at play. There is a distinct impression, at least on opening night, Foreign Radical is largely preaching to the choir. As we progress through the show, which uses the U.S. government terrorist watch-list as its centre, it became evident there was little appetite for governments trampling civil liberties in the name of combating a perceived terrorist threat. While the experience may change depending on the make-up of the room on any given night, there is a sense as the show becomes more familiar to potential audiences it may be attracting a certain demographic. With little dissent and few opposing viewpoints the urgency felt in the show’s 2015 run doesn’t quite materialize. It felt at times much like a Facebook feed, with one’s beliefs and politics being reflected back at us. That isn’t to say Foreign Radical has lost its edge and certainly none of its relevancy. It just means it plays differently. Of course, such an observation must be taken with some skepticism as this is my second viewing. My comments are somewhat mitigated though as my companion on opening night had not seen the show previously, and she walked away with similar thoughts. Don’t let these remarks lessen the veracity of Foreign Radical though, as it still remains one of the most thought-provoking shows I have seen in a very long time. It works on multiple levels, with the most profound coming in the exploration of one’s own beliefs. In my ten plus years of reviewing theatre, I have returned to see a show a second time in only a handful of cases. A return viewing is always predicated by a show’s ability to entirely draw me in, or to be so dense in ideas that only a second viewing can give it full justice. It is within this second criteria where Foreign Radical delivers. With so many ideas presented, it was all but impossible to process it all the first time. I am glad I returned. Foreign Radical will make an appearance in Ottawa at the Magnetic North Festival in June. It will be interesting to hear how it plays to audiences in our nation’s capital. I’m assuming Theatre Conspiracy has already extended an invitation to Justin and Ralph. Foreign Radical by Tim Carlson. Directed by Jeremy Waller. A Theatre Conspiracy production. On stage at Studio 1398 on Granville Island until February 11. Visit http://conspiracy.ca for tickets and information.